The UK-Japan Strategic Dialogue held in London on 12-13 January 2015 presented an opportunity to track the progress of the UK-Japan defence cooperation relationship three years after the signature of the UK/Japan Defence Cooperation memorandum. As part of that agreement, RUSI has done its share of the task by organizing Dialogues in partnership with the Sasakawa Peace Foundation, opening a ‘RUSI Japan’ branch office in Tokyo and publishing commentaries in its journals. This year’s Dialogue was fortuitously scheduled just in advance of the meeting of defence and foreign ministers on 21st January. Despite use of the term ‘strategic’ and characterization by the Japanese side of a ‘new type of Alliance’ in 2013, the relationship is developing at a pace that suggests more humble aims. Joint development of defence technology and inter-service cooperation are concrete indicators of progress, but three years on from 2012, the rhetoric has shriveled from ‘alliance’ to ‘partnership’. That first ‘two plus two’ meeting set a new high in terms of process, but actually yielded nothing new. The RUSI/Sasakawa Dialogue itself, while proceeding in a good natured and industrious atmosphere, left the impression of a relationship that has taken off successfully but is struggling to achieve escape velocity and attain a level that could truly be called ‘strategic’. The drag on the relationship is coming partly from structural divergences between Japan and Britain that make ‘strategy’ difficult, but are nevertheless interesting for what they reveal about the journey of two formerly great but now middle-sized powers in the post Cold-War era. The would-be allies are mis-aligned on a fundamental strategic question: what role they expect to play in the world. This can be seen in how they answer two subordinate policy questions: First, what is the appropriate response to challenges to the system of world order that has prevailed since 1945? Second, what is the right policy mix to control risks and maximize opportunities that arise from the movement Eastwards of the world centre-of-gravity and the rise of China? Japan under Prime Minster Abe seems to have clear answers but his public is hesitant. Britain under Prime Minister Cameron has difficulty expressing a vision that reconciles means and ends. Three years in, my view is that the UK-Japan relationship has a shot at becoming truly strategic by helping both countries overcome their respective difficulties; and to conceive and gain the necessary acceptance for a forward-looking and coherent strategic identity. The strategic divergence that creates drag on the UK-Japan relationship should perhaps not be attributed too much to personalities and leadership but to structural change. Principally, the main features of global politics at the end of the ‘post-Cold War’ era make defining a role in the world confusing for Britain, and simple (if not easy) for Japan. This is because the situation has developed in which strategic coherence – achieved by reconciling national priorities (politics) with strategic priorities (a global role) – has become much easier to achieve for one country than the other. During the Cold War Japan and Britain had the good fortune to be in a position where national politics and global strategy could be reconciled in a global role as middle powers in support of a US-led western strategy aimed at containing the USSR. Britain flattered its self-image of a pocket great power by employing the vestiges of its imperial past to support this effort around the world. Japan could, by virtue of its location, act as an unsinkable aircraft carrier and arsenal against the mainland communist forces in Korea, China and Russia and help the US Pacific fleet to bottle up the Soviet Navy. Japan’s geographical position also meant it could fight the Cold War and play a role of broad strategic importance while simultaneously maintaining a ‘pacifist’ post-war identity that limited the deployment of its military to an area consistent with territorial defence. After the Cold War, the ‘new world order’ of the 1990s was one in which the reconciliation of political and strategic imperatives was much easier for Britain than for Japan. The era of multinational intervention offered opportunities for Britain to act in ways that resonated pleasantly with its self-image of ‘punching above its weight’, while maintaining a key role in western strategy (e.g. in the Gulf War, Bosnia and Kosovo). For Japan, however, the end of the ‘containment’ strategy and the shift of US interests towards the Middle East spelled the end of the political/strategic coincidence by which Japan could stay at home and still maintain its value as a US ally. The first example was the ‘trauma’ Japan experienced under pressure from Washington to give more than financial support to the first Gulf War. Despite the continuation of shared concerns about the North Korean nuclear program, the same problem arose with US action following 9-11, when again Japan’s leaders were pushed to sell a deployment of the Self Defence Forces to the other side of the world in Afghanistan and Iraq. What we see today is a reversal of fortune. The rise of China and the corollary of Obama’s Pivot to Asia brings Japan’s political and strategic interests back into alignment. Washington’s concern about Beijing’s apparent desire to push the US Navy out of the Western Pacific means Japan can now cement its role as an indispensable ally while simultaneously taking steps to ensure its own maritime and territorial defence. Investment in military capability and defence cooperation with Australia, India, the Philippines, India and Vietnam are rising. As Prime Minister Abe puts it, “Japan is back”. The transition from the post-Cold War era via the Global War On Terror (GWOT) has had the effect of clouding the UK’s strategic vision. The experience in Afghanistan and Iraq tarnished the post-Cold War model of ‘intervention’ as a force for good, and undermined the assumption that Britain’s interests are best served by a reflex response to join in America’s wars. The parliamentary revolt against PM Cameron’s effort to win support for action in Syria shows how much that assumption has been eroded. Even without the legacy of the GWOT, President Obama’s pivot to Asia means there are fewer local operations for Britain to support in the hope of buying influence in Washington. Some say the UK’s role is to enable the pivot by covering America’s back in the region, but for many Britons the institutions of ‘Europe’ are seen as the only threat to their sovereignty, and Russia merely as a threat to continental Europe. It is hard for Britain to pivot with America, because China is seen as a market and a source of investment, not as a threat. This could change if Washington decides to take on Russia, but so far the Obama administration has expressed satisfaction at Germany’s leadership of the European defence against Putin. The drivers behind the pivot give Japan strategic focus but leave Britain with a dilemma. London has to decide what kind of relationship it should have with continental Europe, whereas attitudes and policy in China and Korea leave Japan very little choice. Largely due to threats from its continental neighbours, Japan does not really see any alternative to its close alliance to America. Britain does not face a clear direct threat, and therefore debates how much less it can afford to spend on defence. Japan has historically spent such a small portion of its wealth on defence since WWII, raising spending in response to a higher threat perception hardly faces any domestic opposition. There is also a kind of divergence in strategic approach to other issues, such as economics. For Abe as much as for Cameron, economic revival is the number one question in domestic politics. In Britain the prioritization of economic opportunity has been reflected in what is termed the ‘prosperity agenda’ working its way up to becoming a major consideration in foreign policy. One prominent example of this is Britain’s desire to protect economic relations with big markets and sources of investment like China. However, as international and civil tensions in the Indo-Pacific region make economic priorities harder to reconcile with normative values and broader strategic ambitions, the prioritization of commercial opportunity is notable. When, for example, the UK was unable to respond effectively when Beijing barred access of the UK Foreign Affairs Committee to Hong Kong. When the Wall Street Journal writes about ‘London’s kowtow’ to Beijing, what message does that carry to Britain’s strategic partners in Asia about how it balances national self-interest with its principled commitment to ensure a rules-based world order? Abe has made economic revival a matter of national pride in a way that is more consistent with his desire to release Japan from what he calls ‘the 1945 system’ (pacifist mercantilism, dependence on the USA), and nurture a sense of national self-confidence. Abe’s sense of national destiny may be controversial but judging from the results of the recent snap election it can still command public support. Not for the first time, it is being suggested that Japan is ‘in the midst of a serious identity shift’ from neo-marcantalism to liberal interventionism. A source close to PM Abe’s office was heard at the UK-Japan 21st Century group breakfast on 14 January describing Abenomics as a ‘National psyche management policy’. But Britain can’t ‘move on’, not until those who led the country into these wars own up to their mistakes. The problem is almost all of those now senior enough to lead on strategic thinking owe their stars and political stripes to their participation or acquiescence in these failed conflicts, so admitting failure is a personal betrayal. The RUSI dialog offered a small vignette of this problem. In the session on intelligence, the former head of the UK Secret Intelligence Service (also known as MI6) Sir John Scarlett noted that there is no point having intelligence cooperation unless you actually have some intelligence to exchange, so he would concentrate on identifying some of the good practices and principles that can be passed from UK to Japan; for instance, the importance of keeping collection separate from analysis, to protect against politicization of the product. According to the Chatham House rule, I cannot quote the answer to a question as to what lessons Japan might draw from the UK’s difficulties with intelligence around the Iraq war, but I can say that it elicited little more than a pained expression. It is a curious irony that as the 70th anniversary of the end of WWII approaches, both Japan and the UK find their strategic vision blurred by different legacies of shame and defeat. PM Abe wrestles with his conscience to find a message that is true to his personal belief (Japan needs to put the war behind it) but that is broadly acceptable to the nation at large as well as former enemies (Japan has to remain sorry). It does not make it any easier for him to achieve his long held ambition of revising the ‘peace’ constitution (or at least its interpretation) in order to allow Japan to use its military like a normal country. In the case of the UK, the 70th anniversary also brings us the latest test of our confidence in the form of the Strategic Defence and Security Review (SDSR), which requires us to articulate what we thing of our role in the world in terms of our commitment to military spending and policy. Hearings of the UK House of Commons Defence Select Committee in preparation for the 2015 SDSR have taken note of the relationship between national psyche and defence policy and security strategy, so it was fortunate that Rory Stewart MP, who currently chairs that Committee, was invited to speak at the opening session of the 2015 RUSI ‘UK-Japan Strategic Dialogue’. Rory Stewart was one of those whose public career has been built on the back of the UK’s involvement in Afghanistan and Iraq, about which he now seems to have mixed feelings. This may be one of the reasons why he chose to make a rather surprising suggestion. Rory Stewart caught the audience’s attention by opening the strategic dialogue with an appeal for ‘honesty’ and ‘seriousness’. As he developed this theme, he returned several times to the words ‘honest’ and ‘serious’. Japan has long been respected by the UK as a ‘serious’ country. ‘We used to be a serious country. Can we be again?’ he mused. Not everyone present seemed comfortable with what the question implied. The speaker had touched a nerve. Rory Stewart diagnosed a common problem facing Britain and Japan: being former great powers but not now superpowers, and thus find it difficult to calibrate their role on the world stage. The remedy, according to Stewart, was for Japan and Britain to develop an ‘honest’ friendship, including sharing an assessment of US strategy, and a critical appraisal of what they are capable of doing together. The logic was that if we are more honest, we will avoid trying to do more than we are capable of (thus inevitably failing), and thus become more serious. Well, looking at the RUSI meeting as a fair sample, how do we grade the ‘honest’ and ‘seriousness’ of the alliance? The prospects of the Anglo-Japan relationship? There is clearly room for improvement in actioning this list, much of which goes back to 2012. Rory Stewart commented that the UK currently contributes far too little to UN peacekeeping and the same may be said of Japan. PM Abe’s ambition of making a ‘proactive contribution to Peace’ is yet to come into focus. Former Minister of defence Onodera speaking at the RUSI Dialogue, defined this policy in terms of increasing the contribution of people to Peace keeping Operations (PKO), and increasing the contribution of enablers (e.g. logistical units) to PKO. Akira Sato described the UK as a ‘significant partner’ of Japan, adding that he hopes to see the relationship elevated after Japan passes legislation pursuant to the re-interpretation of the Constitutional prohibition on participation in collective self-defence. Certainly the agreement of an acquisition and cross servicing agreement and other legal procedures to enable operational support could be of use in the event of British forces working alongside their Japanese counterparts. Until that day, plenty more can be done in joint training, and doctrinally challenging areas like the ‘comprehensive approach’ and civil-military cooperation. There are reasons to be optimistic about the prospects for cooperation in the maritime sphere, which also has a strong historical precedent. Former Japan Minister of Defence Onodera recalled in his RUSI talk the history of Anglo-Japan naval cooperation with the case when the Imperial Japanese Navy escorted the ANZAC convoy ‘Albany’ across the Indian Ocean and into the Mediterranean during WWI. Today the Royal Navy is back ‘East of Suez’ in its new base in Bahrain and is going ahead with the commissioning of two large and highly capable aircraft carriers. Ambassador Ishii Fumio called the Bahrain base ‘very good news for Japan’ and beckoned the Royal Navy to ‘come on out’ to the Indian Ocean. Japan’s only overseas base is close by in Djibouti, so there are prospects for cooperation in the Indian Ocean and the Gulf. Japan is once again host to a RN officer (the first since the Anglo-Japan Alliance of the 1920s), who doubles as liaison to the US 7th Fleet and the Japanese Maritime Self Defence Force. There is even a chance to see the UK’s Royal Marines get involved with the recent initiative in Japan to establish an amphibious capability. But even if the means exist for cooperation, it has to be for some common objective. Is the UK willing to join Japan in defending the principle of global freedom of navigation at sea? That question turns out to be a real test of the UK-Japan’ relationship’s honesty and seriousness. Speaking recently at a function in Brussels, Japan’s Foreign Minister Kishida Fumio observed that “winning another country’s trust takes time and concrete actions as well as words are required”. The context of his remark was the explanation of how Japan gained trust in the years after WWII, but the same principle could be applied to evaluate Japan’s relationship with its European partners. Kishida was linking the situation in Ukraine with that in the East China Sea when he stressed that the Helsinki final principles “should be applied not only to Europe but also to international relations covering the entire globe” . This question of integrity is closely related to the ‘seriousness’ of the relationship. 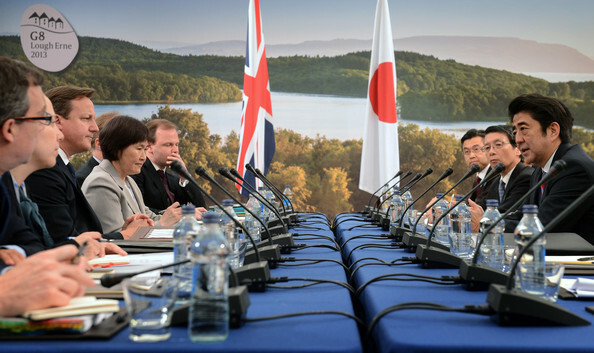 One of the Japanese participants at the RUSI dialogue observed that “when people around the world are having a hard time, someone needs to go out and fly the flag – Britain and Japan can do that.” But is the UK passing Kishida’s integrity test? There was an unmistakable sense at the RUSI gathering that some in Japan are disappointed with the UK in this regard. A source close to PM Abe’s office expressed dismay at Britain’s lack of seriousness with regard to China over HK. “The rise of China is not understood as a threat to the West; but actually it is challenging some of the most important principles that human beings have achieved. China’s expansionist policy is related to the suppression of minorities and other violations of human rights. How can the West, the champion of democracy and human rights, ignore this?. One of the Japanese participants at the RUSI Dialogue proposed the following thought experiment: imagine the reaction in Europe if Japan had said in response to Russia’s moves in Ukraine ‘both sides must exercise restraint and our economic relations must remain unaffected’ – i.e. the way Europe and the UK responded to China’s assertiveness in the Asia-Pacific (confrontations at the Senkaku islands, in the South and East China seas, the crackdown in Hong Kong). Observers in Japan may, however reluctantly, be recognizing Britain’s inability to overcome this conflict of interest, and so considering another less intimate kind of partnership. Ambassador Ishii Fumio (Japan’s man in Brussels) responded to Rory Stewart’s observation that Britain and Japan not superpowers with a comment that both are ‘global powers’. Ishii sees Indian Ocean maritime security and weak states in Africa as areas for cooperation, but with Britain contributing to Japan’s security principally by relieving the burden America’s burdens outside the Asia-Pacific (e.g. intervening in weak states in the European periphery and Africa). While there may be a clear interest for Japan in ensuring that Washington’s main effort can be devoted to Asia, a merely regional role might be too much of a demotion for the UK to accept. The current UK government’s promise of a referendum on EU membership also poses a risk for the UK-Japan strategic partnership. As ambassador Hiroaki Fuji noted at Chatham House in 2013, “… the world desperately needs a globally oriented Europe. From the viewpoint of Japanese investors, it is of crucial importance that the UK should firmly maintain its role as the gateway to the European market”. One of the Japanese speakers at the strategic dialogue deftly handled a question on Japan’s view about the UK referendum on leaving the EU by affirming that the present position of the UK being engaged in the EU was one much valued in Tokyo. If a need to ‘move on’ from past failures and humiliations is a strategic requirement both countries seem to share, then the managers of the Strategic Dialogue should consider the role their institution can play in the necessary process of ‘national psyche management’. 2015 is a good year to do so, because both nations are conducting processes to re-frame national strategy on the basis of lessons learned from the past. In the UK the Chilcot report should finally be released, which could help to clear the air in advance of the wider debate on the National Security Strategy and the 2015 SDSR. Britain has already entered a period of “quite significant change, including also a discussion about Britain’s place in the world, its relationship with the EU and other things”. Meanwhile PM Abe will use his new electoral mandate to pursue his ambitions for constitutional revision or re-interpretation, and submit legislation to the diet that will enable Japan’s self-defence forces to be used as a military instrument of foreign policy. On 25 February 2015, Abe launched the “Advisory Panel on the History of the 20th Century and on Japan’s Role and the World Order in the 21st Century”. The panel is charged with answering six questions connecting Japan’s future role in the world with lessons learned from 20th century history and experience with war. Because of the way war memory informs public perceptions on the role of the military, the anniversary of Japan’s surrender is sure to add extra weight to the debate, and to link it with regional – and possibly global – politics. Japan’s legacy of empire has long shaped diplomatic, economic and security relations with its neighbours, but this year’s 70th anniversary looks set to become a global battleground, in which the war’s meaning will be instrumentalised for a much wider purposes. Russia’s plans to jointly commemorate the end of the war with China and North Korea broadens the context both geographically and conceptually. President Putin has already commemorated last year’s anniversary in of the surrender in Europe with a military parade in Crimea. The plans for 2015 include an exchange of visits with China’s President Xi Jinping to commemorate the end of the ‘anti-facist war’ and celebrate the ‘post-WWII international order’, which institutionalized the dominance of the victor nations over Japan and Germany. According to a report in the Global Times, President Xi and his Russian counterpart said “the two countries will take this event as an important chance to jointly safeguard the outcome of the victory of WWII and post-WWII international order”. For all these reasons, the 70th is the perfect opportunity for the UK and Japan to use their relationship to signal a fresh departure from old thinking. The UK should respond to the Moscow/Beijing narrative by using the 70th anniversary to affirm its commitment to a global ambition to promote with balance and integrity both economic interest (participation in the Asian century) and core values (support of a rules based system of international law in Asia as well as in Europe). Meanwhile Japan should confirm that this is the role expected of Britain. A more honest and serious dialogue offers ways for Japan and Britain to overcome respective difficulties that are getting in the way of ‘moving on’ strategically. Japanese observers see the UK’s 2015 SDSR as a ‘milestone’ to measure the UK’s engagement policy and the expectation among some that it will express the UK’s intention to show a presence in the Asia-Pacific sets the bar on this. Registering the desire to partner with the UK at the global level sends a strong signal to those who would argue for more ‘managed decline’. Japan’s willingness to develop something more like an ‘alliance’ than a ‘partnership’ would help project a vision of UK foreign and security policy that is forward-looking, global and strikes the right balance between interests (being part of the Asian century) and values (rules based world order). A serious response to the Chilcot findings and a well coordinated narrative on the 70th anniversary should re-affirm the role of UK in upholding the rules based order. A commitment to Japan would also send the signal that Britain is the kind of power that welcomes trade with China but not at the expense of fundamental values (commitments to the rights of the Hong Kong population, the settlement of territorial disputes by peaceful means, etc.). For Japan, the main strategic obstacle is the lack of public trust in political leadership and fear that military and intelligence institutions will again drag the nation into peril and disgrace. British soft power can help in a number of ways. Building on the successful history of Anglo-Japanese reconciliation, a firm commitment to cooperation in the sphere of defence and security may help to reassure the Japanese public that such fears of history repeating itself are not universally shared, even among former enemies. The UK can try and ease Japan’s sense of isolation by developing an honest dialogue on its own past mistakes with regard to the Iraq war, which is anyway widely considered unlawful at best, and a crime of aggression at worst. This will be necessary anyway in order for the British strategic establishment to ‘move on’ in terms of regaining the trust of the British public and projecting a vision of national purpose in the 21st century world. Then by demonstrating its willingness to work closely with the Self Defence Forces on maritime security and peace operations, the UK can ease the task of advocates in Japan who are attempting to obtain public acceptance on the legitimacy of Japan employing its military capability in a global role. Strategic Communications. On the occasion of the 70th anniversary, London and Tokyo should coordinate strategic communications (also with the US, Australia and other like-minded nations), in order to present a positive forward-looking narrative of continuing partnership between the great democratic powers of the post-war era, giving due credit to the power of reconciliation and universal values of respect for the rights of the individual under the rule of law. Maritime. Concentrate effort (and reinforce success) on the Maritime level. Royal Marines and the MSDF/GSDF for amphibious operations across the full spectrum from humanitarian and disaster relief (as with operation Tomodachi) to hi-end combat operations to re-take islands or deploy preventively to deter violations of sovereignty. Other options could include training with the Special Boat Squadron (amphibious special forces) and the deployment to Japan of a Royal Marines liaison officer to stand alongside the Royal Navy Commander there. Peace operations. As General Hokazono mentioned at the RUSI conference, the identification of more counterpart entities between governments can help to structure cooperation on concrete objectives, as well as supporting relations with the US and NATO. In view of PM Abe’s ambition that the Self Defence Forces make a ‘proactive contribution to peace’, a counterpart in Tokyo should be selected to work in close partnership with the UK Stabilisation Unit to share good practices, conduct policy workshops, exchanges and training on peace operations and the comprehensive approach. Despite the success of defence cooperation in the UK-Japan relationship, the lack of a coherent Asia policy on the UK side (in particular a lack of clarity on what kind of global role strikes the right balance between our values and our interests where China is concerned), is a source of drag that prevents it taking off to the strategic level. As the shift of global wealth and competition is moving East, the UK’s national and global roles (political and strategic) are at risk of coming apart. For Japan, the opposite is happening – which is what makes this relationship worth investing in, not just in terms of the defence industrial opportunities, but at the highest strategic level. Rory Stewart’s appeal for an honest approach in order to deliver a serious result has merit. However, there also needs to be a shift in British public opinion to commit to a strategic ambition that rises above the level of national or regional policy. The strategic choice for the UK in 2015 is between decline and renewal, but the public does not seem ‘committed’. A solid partnership with Japan can be part of a coherent strategic vision that will encourage the ‘renewal’ camp. For Japan the visionary leadership is there, but the problem lies in connecting with the population and the outside world. The UK can assist in helping Japan overcome the hesitancy and anxiety about assuming a more ‘normal’ role, and developing the operational and strategic habits that accompany that. This year’s 70th anniversary of the end of WWII offers an opportunity for reflection on the lessons of history and the importance of taking a stand against aggression and violation of international order. Would-be allies Japan and Britain should take this opportunity to raise the bar on honesty and seriousness. S. Chelton, “Japan’s Security in search of new partners?” RUSI Journal, June/July 2012 Vol. 157 No. 3 pp. 32–37. “By mentioning the Anglo-Japanese Alliance, I am not seeking merely to dwell on past glories. Surely we had the tragedy of another war which we fought against each other and have always to squarely face. However, we are now nurturing a new partnership in the defence and security areas, which perhaps we can call a new type of alliance.” H.E. Keiichi Hayashi, Ambassador of Japan to the Court of St James’s, 23 July 2013 Speech at the Portsmouth Naval Reception, referred to the relationship as ‘a new type of alliance’. http://www.uk.emb-japan.go.jp/en/embassy/ambassador/speech/PortsmouthNavalReception.pdf (accessed 21 January 2015). “London Kowtow to Hong Kong”, Wall Street Journal, 20 January 2015. https://www.google.com/url?rct=j&sa=t&url=http://www.wsj.com/articles/london-kowtow-on-hong-kong-1421706765&ct=ga&cd=CAEYACoTNjAxNDk0MDY3NjcwMDY0MTczMzIZYjM1ODIzODVjOWRiMGI2NTpnZTplbjpHRQ&usg=AFQjCNGj69ej44xq91RrEWcLv8HKGYdIDA (accessed 21 January 2015). WEDGE January issue report 2012 December 21 http://wedge.ismedia.jp/articles/-/2457?page=1 (accessed 24 January 2015). S. Kitaoka “The East Asia Security Situation and the role of the United Kingdom”, Chatham House Asia Conference Report UK–Japan Global Seminar: Fostering Strategic Partnerships 20–21 June 2013, p. 16 http://www.chathamhouse.org/sites/files/chathamhouse/home/chatham/public_html/sites/default/files/20130620UKJapanConferenceReport2.pdf (accessed 24 January 2015). The UK Royal Navy and Japan Maritime Self-Defence Forces worked closely together, including an exchange of officers during a mine clearing exercise in the Gulf, in November 2014. The Policy Dinner Club is proud to announce that its next speaker will be Junichi Nishiyama, who will speak about current trends in the UK-Japan defense relationship, while touching upon possible future cooperation in defense industry and space technology. A dinner discussion will then ensue on the topic offered. The relationship between the UK and Japan has begun to grow rather quickly over the past 10 years, and the recent 2+2 (foreign and defense ministers meeting) in London this January saw a number of future defense and security agreements made. Among these include defense cooperation in industry, cyber and space. Of these, the latter has quickly grown in importance as a facet of national security. Meanwhile, there has been a steady decline in UK defense research and development, coupled with decreased defense spending. The combination has meant that the UK must do more with less, and this requires it to reach out to defense partners across the globe, who reflect its values and commitment to human rights. Japan fits the bill, having remained at peace for nearly 60 years. Similarly, Japan faces a broad range of challenges in the Asia Pacific, including continued North Korean bellicosity and growing Chinese military power. For that reason, Japan defense industry has begun to reach out for foreign partners, as Japanese political leaders lean more and more towards the West as a means of hedging their threats. Please note that dinners are filled on a first-come, first-served basis. Please also note that there is a dress code at the Club and diners are expected to adhere to that. Mr. Nishiyama is a Senior Research Fellow at the Institute of Future Engineering, a Director at the Japan Forum for Strategic Studies and a senior adviser to the Lower House of the Japanese Diet on technology. He began his career at Mitsubishi Heavy Industries (MHI) in 1971, and has worked on missile systems development, the Patriot System, and Ballistic Missile Defense as an engineer. He became a General Manager of the Guided Weapons Department in 1998, and Deputy General Manager of the Aerospace Headquarters in 2004. In 2011, he became a senior advisor to MHI and since then worked in and around policy-making in the think tank community, working and speaking with AFCEA, CSIS, JFSS, among others. Mr. Nishiyama continues to give advice to a number of senior politicians within the LDP on space technology, among other areas of research.